The car was driven by the inebriated driver in a rash and negligent manner ramming into a footpath. BMW car accident near Basavatarakam Cancer Hospital. 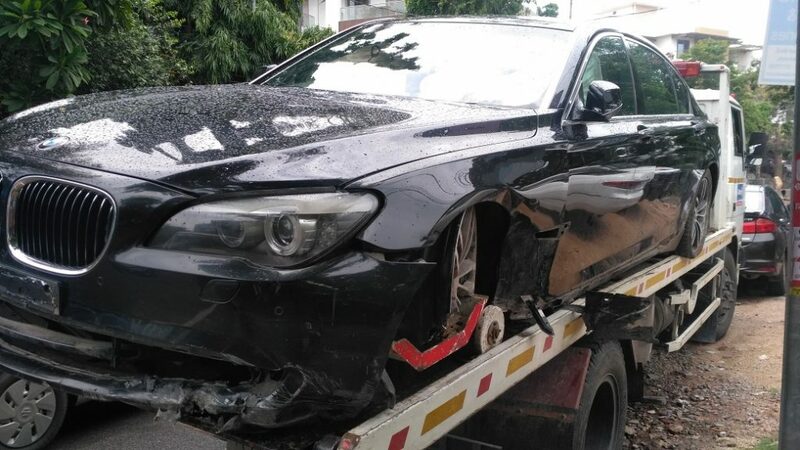 Hyderabad: The Banjara Hills police arrested two persons in connection with an accident case involving a BMW near Basavatarakam Indo-American Cancer Hospital in the early hours on Saturday. The car was driven by the inebriated driver in a rash and negligent manner ramming into a footpath. According to the police, the car bearing number AP 12 K 4444 was being driven by one B Magesh,19, a realtor from Banjara Hills had who was returning from a party at Kondapur. After the party, he came to drop a female friend in the car, when the incident occurred. “Nobody was hurt. Before we reached the spot, Magesh and his friend left the spot along with the number plate. He was arrested later and he confessed the crime. The breath analyzer also confirmed he was drunk. His blood sample too was collected,” police said. Magesh’s friend and the car owner Nitinesh,27 was also arrested later for allowing him to drive in an inebriated condition. A case was booked.